The U.S.-Cuba relationship has been plagued by distrust and antagonism since 1959, the year Fidel Castro overthrew a U.S.-backed regime in Havana and established a socialist state allied with the Soviet Union. During the half century that followed, successive U.S. administrations pursued policies intended to isolate the island country economically and diplomatically. The United States has sanctioned Cuba longer it has any other country. Presidents Barack Obama and Raul Castro, who succeeded his brother as Cuban leader in 2008, took some extraordinary steps to normalize bilateral relations, meeting with each other, restoring full diplomatic ties, and easing travel restrictions. However, President Donald J. Trump has reversed some of his predecessor’s policies, and some observers expect that his administration will only become more confrontational with Cuba. The tumultuous U.S.-Cuba relationship has its roots in the Cold War. In 1959, Fidel Castro and a group of revolutionaries seized power in Havana, overthrowing the U.S.-backed government of Fulgencio Batista. The United States recognized Castro’s government but began imposing economic penalties as the new regime increased its trade with the Soviet Union, nationalized American-owned properties, and hiked taxes on U.S. imports. After slashing Cuban sugar imports, Washington instituted a ban on nearly all U.S. exports to Cuba, which President John F. Kennedy expanded into a full economic embargo that included stringent travel restrictions. The United States severed diplomatic ties with Cuba and began pursuing covert operations to overthrow the Castro regime in 1961. The Bay of Pigs invasion, a botched CIA attempt to topple Castro, fueled Cuban mistrust and nationalism, and Cuba allowed the Soviet Union to install nuclear missile sites on the island in secret. U.S. surveillance aircraft uncovered the installations in October 1962, setting off a thirteen-day showdown between Kennedy and Soviet leader Nikita Khrushchev that threatened to escalate into nuclear war. In the end, Khrushchev agreed to withdraw Soviet missiles in exchange for a pledge from Kennedy not to invade Cuba and to remove U.S. nuclear missiles from Turkey. In the decades that followed, economic and diplomatic isolation became the major prongs of U.S. policy toward Cuba. In 1982, President Ronald Reagan labeled Cuba a state sponsor of terrorism for its support of leftist militant groups in Central America and Africa. Both Presidents George H.W. Bush and Bill Clinton signed laws—the Cuba Democracy Act of 1992 [PDF] and the Cuban Liberty and Democratic Solidarity Act of 1996 [PDF]—that strengthened U.S. sanctions and stated that the embargo would remain in place until Cuba transitions to a democratically elected government that excludes the Castros and upholds fundamental freedoms. Some adjustments in 1999 allowed for the export of certain U.S.-made medical supplies and food products to the island. Restrictions tightened, however, under President George W. Bush, whose Commission for Assistance to a Free Cuba increased enforcement of existing sanctions. The Cuban government estimates that U.S. trade restrictions have cost the country more than $125 billion since the start of the embargo. During his 2008 presidential campaign, Barack Obama said it was time for the United States to “pursue direct diplomacy” with Cuba. Several weeks after taking office, he eased restrictions on remittances and travel, allowing Cuban Americans to send unlimited funds to Cuba and permitting U.S. citizens to visit Cuba for religious and educational purposes. Over the course of his first term in office, Obama continued to modestly loosen restrictions in these areas. Meanwhile, the new Cuban leadership also signaled an openness to reform. Facing an aging population, a heavy foreign debt load, and economic hardship amid the global downturn, Raul Castro began in 2009 to liberalize parts of Cuba’s state-controlled economy. Reforms in subsequent years included decentralizing the agricultural sector, relaxing restrictions on small businesses, liberalizing real estate markets, easing Cubans’ ability to obtain permission to travel abroad, and expanding access to consumer goods. Cuba’s private sector swelled as a result, and in 2014 was reported to be about 20 percent [PDF] of the country’s workforce. The Cuban government estimated that the number of self-employed workers nearly tripled [PDF] between 2009 and 2013. Still, state companies account for roughly seventy percent of the island’s economic activity. 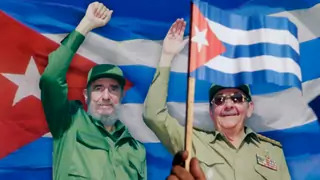 Obama and Castro surprised the world in late 2014 by announcing that their governments would restore full diplomatic ties and begin to ease more than fifty years of bilateral tensions. The historic moment marked the culmination of eighteen months of secret diplomacy brokered by Pope Francis in which the parties agreed to an exchange of prisoners, including Cuban intelligence officers and an American development contractor, among other concessions. The thaw continued in the months that followed. The Obama administration further eased travel and trade restrictions and removed Cuba’s designation as a terrorism sponsor, a major obstacle to normalization. The two governments also reopened their embassies, a move met with widespread public support in both countries. In early 2016, President Obama took another significant step toward normalization, visiting Havana in the first trip to Cuba by a sitting U.S. president since Calvin Coolidge toured the island in 1928. In a keynote address broadcast live, with Raul Castro sitting in the audience, Obama urged both countries to press on with reforms. The Cuban government should continue political and economic liberalization, and the U.S. Congress should lift the trade embargo, he said. Ahead of his trip, Obama further loosened travel and financial restrictions. Later that year, American commercial airlines began offering service between the countries for the first time in more than fifty years. Days before leaving office in January 2017, Obama repealed the “wet foot, dry foot” policy, which had since 1995 allowed Cubans who reached U.S. shores without authorization to pursue permanent residency there. The move brought the U.S. government’s treatment of Cubans in line with its handling of other undocumented immigrants. The Cuban government welcomed the change and agreed to allow back into the country all Cubans removed by the United States. The death of Fidel Castro and election of Donald J. Trump in late 2016 rekindled debates over U.S.-Cuba policy. As a candidate, Trump was fiercely critical of the Obama administration’s thaw with Cuba and pledged to reverse course once in office. However, thus far, he has left many of his predecessor’s policies in place, including diplomatic relations. [The Trump administration] is considering labeling Cuba a state sponsor of terrorism once again. Meanwhile, the Trump administration continues to criticize the Cuban government for its poor human rights record and single-party system, upheld by the country’s new constitution. In 2018, Vice President Mike Pence and National Security Advisor John Bolton both gave high-profile speeches criticizing Cuban leadership for its ties to the embattled socialist regimes in Nicaragua and Venezuela. Bolton characterized the three states as a “troika of tyranny” that are the cause of massive human suffering and regional instability. The Trump administration again turned up pressure on Cuba in March 2019, when it opened up a month-long window in which U.S. citizens could sue dozens of Cuban companies that traffic in confiscated property. Though Congress provided for this in the 1996 Helms-Burton Act, U.S. presidents had suspended this right ever since. The Trump administration may renew this and related policies in April. It is also considering labeling Cuba a state sponsor of terrorism once again, a stance that is unlikely to change with new President Miguel Diaz-Canel in office. Brianna Lee and James McBride contributed to this report. This White House fact sheet outlines the Trump administration's policy changes toward Cuba. Marguerite Jimenez argues in Foreign Affairs that the Trump administration should reach out to Diaz-Canel. In her book Cuba: What Everyone Needs to Know, Julia Sweig offers a guide to the island’s politics, its relationship with the United States, and its shifting role in the world. Michael Bustamante looks at the consequences of Trump’s rollback on Cuba in Foreign Affairs. This Global Economic Dynamics video series, The Crossroads: Cuba, examines changes taking place in Cuba.